The Secretary of Education will step down at the end of the year, after proving himself a champion for the corporate reform movement. To understand the legacy of outgoing education secretary Arne Duncan, look to the Crescent City. Hurricane Katrina, Duncan said once, was “the best thing that happened to the education system in New Orleans.” What the disaster did was enable state legislators and out-of-state reformers to transform the system on an unparalleled scale. Nearly all of the schools were converted to charters, which receive public funds but have less oversight than traditional public schools. Some 7,500 unionized teachers and other employees were fired, many of them people of color. The city’s teaching core went from 71 percent black in 2004 to less than 50 percent last year. To avoid closure, new schools had to focus on raising standardized test results. Scores did go up; more than 60 percent of elementary and middle-schoolers passed state tests last year, up from 37 percent in 2005, and graduation rates have risen. But it’s not clear the gains are due to the kinds of reforms that people like Duncan champion, such as tying teacher accountability to test results. The flood of philanthropic and federal money that went into the charter system after the hurricane was unprecedented; such an investment might have improved the city’s traditional (and broke) public schools, too, if they hadn’t been shuttered. “He’s a nice guy who cares about kids, but he showed that in all the wrong ways in policy and practice." Duncan, who announced his resignation last week, took over at the Department of Education several years after the New Orleans overhaul began. But he’s pointed to the city as a sort of blueprint for remaking public education across the country. It’s the place where his vision for school reform was most fully realized. Whether the overhaul was a miracle or misguided is a question about Duncan’s legacy more broadly. Once called a “budding hero in the education business,” Duncan proved himself a champion for those who saw a money-making opportunity in America’s beleaguered public school system—the charter school and testing industries, for instance. Pushing a market-based vision of reform, Duncan oversaw mass school closures and a deepening obsession with standardized tests, which he said was necessary to prevent teachers from “lying” to children about their preparedness. He opened the door of the Education Department to “the Billionaire Boys’ Club,” people from philanthropic groups like the Gates Foundation and the NewSchools Venture Fund. Teachers, on the other hand, felt shut out, and alienated by a narrative of educational inequality that framed it less as a legacy of racism and poverty than a reflection of their own shortcomings. The corps of professional educators shrunk and grew less diverse. After Barack Obama was elected, many hoped he would apply his campaign-trail promise of change to the punitive testing regime ushered in by George W. Bush and No Child Left Behind. But Obama passed over former teacher and education expert Linda Darling-Hammond in favor of Duncan, his basketball buddy, who’d aligned himself with the corporate reform movement as CEO of Chicago Public Schools. 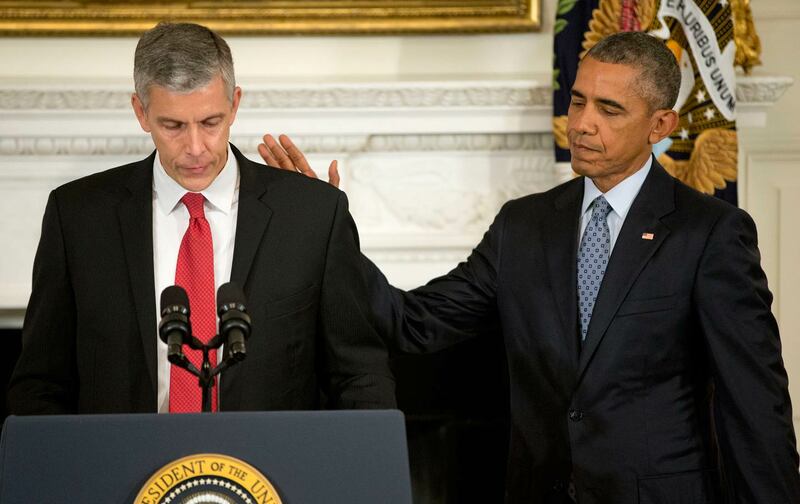 As Secretary, Duncan “continued and carried the torch for pushing educational policies that don’t have basis in research, such as value-added measurements, using high-stakes testing to evaluate teachers, or continuing to promote charters schools as a silver bullet to solve inequality,” said Wayne Au, who teaches in the education program at the University of Washington. "While Duncan spoke often accountability, he applied it selectively." “He’s a nice guy who cares about kids, but he showed that in all the wrong ways in policy and practice,” said José Luis Vilson, a math teacher and activist in New York, summing up an assessment of Duncan that many progressives have articulated since he announced his resignation. He’ll be replaced by John King Jr., a former New York State education commissioner with a similar philosophy of reform. The gulf between what poor and rich school districts are able to offer their students has not closed under Duncan, either. “The common situation in America is that schools in poor communities spend less per pupil—and often many thousands of dollars less per pupil—than schools in nearby affluent communities, meaning poor schools can’t compete for the best teaching and principal talent in a local labor market and can’t implement the high-end technology and rigorous academic and enrichment programs needed to enhance student performance,” reads a 2013 report from a congressional commission on equity in education. Duncan did push for greater investments in early childhood education, and he helped secure $40 billion for Pell Grants, which support low-income college students. He’s also been credited with “cracking down” on for-profit universities like Corinthian Colleges, and he’s promised debt relief for some student borrowers. But advocates for student debtors say Duncan’s department has made the process prohibitively complex. As of September, none of the 4,000 people who say they were defrauded by Corinthian have received loan forgiveness.